"The adventure continues . . ."
The year is 1957 and famed archaeologist/adventurer Indiana Jones (Harrison Ford) is looking at an indefinite leave of absence from his posting at Marshall college after events in Area 51 place him under suspicion of being a Soviet spy. Meeting up with greaser Henry "Mutt" Williams (played by Shia Lebouf) leads to a change in plans to track down a kidnapped colleague Harold Oxley along with old flame Marion Ravenwood (Karen Allen), and the legendary crystal skull of Akator. The crystal skull is believed to belong to an alien form and to hold great psychic powers. Legend has it that anyone who returns the skull will be granted a "great gift". It then becomes a race to beat the Soviets to the site and prevent them from gaining the advantage of psychic warfare. Indiana Jones and the Kingdom of the Crystal Skull became the most recent addition to the Indiana franchise in 2008. A cross between the action genre and science fiction this film was produced/written by George Lucas and directed by the acclaimed Steven Spielberg. Released nineteen years after the last one this film pays tribute to the sci-fi B-movies of the era. To maintain the aesthetic continuity the crew relied on traditional stunt work and Harrison Ford did his own stunts despite being 64 at the time of production. Nominated for over 13 awards and winner of four including the Saturn Award for Best Costume Design and Best Film Music from the BMI. This film has a run time of over 120 minutes and is rated PG-13 for violence, some language, and disturbing imagery. There is one instance of sexual innuendo, and multiple examples of violent/creepy themes including several moments of unusual onscreen death. One particular moment involves a villain being murdered by giant red ants and another is the disintegration of a character. There also brief scenes of mild drug usages such as drinking and smoking. Indiana Jones and the Kingdom of the Crystal Skull is currently available to watch and stream, download, buy on demand at Netflix, Amazon, Vudu, Google Play, iTunes, YouTube VOD online. 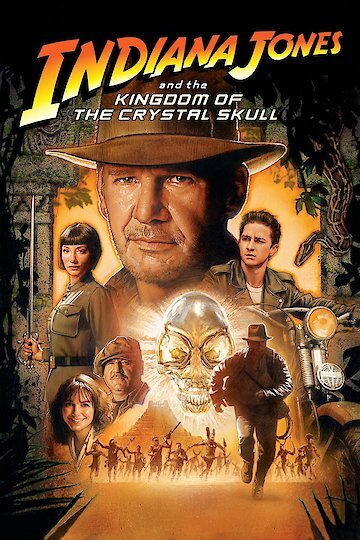 Indiana Jones 5: A Sequel to Kingdom of the Crystal Skull? The last thing fans of the Indiana Jones franchise want is Kingdom of the Crystal Skull 2, but that's what they were afraid producer Frank Marshall was promising them earlier this week. Just about everyone had something critical to say about the fourth Indiana Jones movie "Indiana Jones and the Kingdom of the Crystal Skull," and now you can add Steven Spielberg to the list. In a recent interview, he threw George Lucas under the bus for the film's goofy aliens. Does at least one key cog in the "Indiana Jones" machine know when to walk away? Producer Frank Marshall claims that, as far as he's concerned, "Indiana Jones and the Kingdom of the Crystal Skull" should be the last chapter. George Lucas isn't writing anything as yet, and Marshall just doesn't see a good new direction. So if Lil' Indy is to be believed, it seems that George Lucas and Steven Spielberg might be ready to set the pail beneath an audience-beloved cash cow's udders one more time. MTV spoke with Shia LaBeouf at the MTV Movie Awards earlier this week, and the man who played Indian Jones' long-lost son in "Indiana Jones And The Kingdom Of The Crystal Skull" claims that not only is a fifth flick on the way, he's already glimpsed the script.